The coin in the photos is the one you will receive. Technically it's not a coin, but rather, a token. 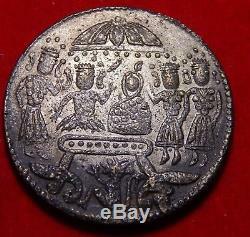 A Ramatanka (Hindu Temple token). Esen literally picture coin is the Japanese equivalent. Composition: White Silver (Silver admixture with brass)Age: Unknown. 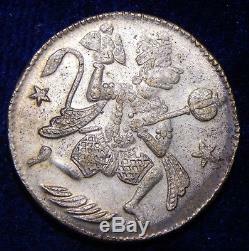 Obverse: Hanuman gleefully advancing right with scepter, stars on left and right. Reverse: Family of five at hearth, animal figure under table. Hanuman, in Hinduism, is a celebrated disciple of Lord Rama, who is himself, the 7 th avatar of Vishnu. Outside of Hinduism, Hanuman can also be found in Buddhist, Jain, and Sikh texts. Ramatanka are and were common in the Indian subcontinent. During the British Occupation, the East India Company made many modern depictions of such coins. Feel free to send me a message with any questions you might have. It must be mentioned that while the lack of East India Company doesnt automatically merit authenticity, age, melt value or perhaps even (as the value is in the beholder) intrinsic value, the lack of the Companys insignia does give credence that this coin is older than just a couple of hundred years. 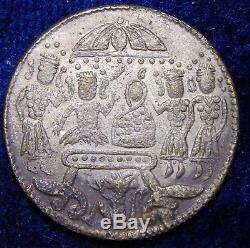 The item "India ND Hanuman & Family Silver Hindu Ramatanka Temple Token Rare Esen Coin" is in sale since Sunday, May 13, 2018. This item is in the category "Coins & Paper Money\Coins\ World\Asia\India\Princely States". The seller is "jlarctica" and is located in Ames, Iowa. This item can be shipped to United States, Canada, United Kingdom, Denmark, Romania, Slovakia, Bulgaria, Czech republic, Finland, Hungary, Latvia, Lithuania, Malta, Estonia, Australia, Greece, Portugal, Slovenia, Japan, Sweden, Belgium, France, Hong Kong, Ireland, Netherlands, Poland, Spain, Italy, Germany, Austria, Singapore, Norway, Croatia, Chile, Colombia, Costa rica, Dominican republic, Panama, Trinidad and tobago, Guatemala, Honduras, Jamaica.